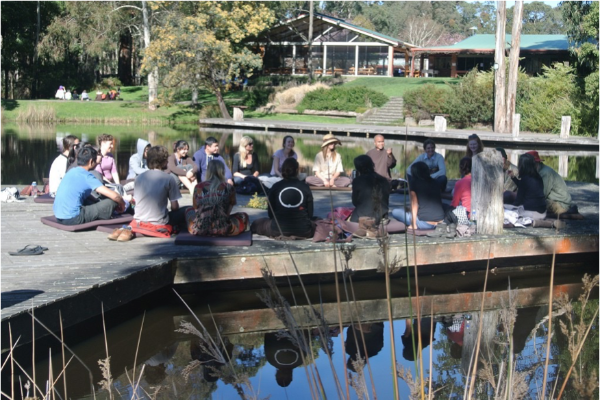 It has been six months since the first Plum Village Australia Spring Opening Retreat in September 2014. We are preparing for the second Spring Opening Retreat 2015, to be held during the period of Sept 18 - 23, with the theme ‘Nourishing our Beloved Community’. I would like to share some thoughts about the on-going process of Sangha building and development for Plum Village Australia in spiritual as well as physical development. I am back. Someone is singing. ‘Smile. Life is a miracle. Happiness is not built of bricks and stones’. ‘Be a flower’ I remind myself. ‘Happiness is not built of bricks and stones’. There are quite a few things that concern us all, regarding Nhap Luu Monastery. There are 3 sisters staying at Nhap Luu right now, instead of 11 as there were last year. The reasons are that visas for the 6 sisters from Vietnam expired last November, and two other sisters changed their practising centers. New visa applications are being done for 6 new sisters to come from Vietnam. The Plum Village monastics are considering the possibility of having more monastics come to Australia including brothers. This has been under discussion for some time. However, given the need to have more brothers in some other centers to support more pressing needs in those places, we have not been able to quickly set up a Monks' Sangha in Nhap Luu. I am hoping that it might happen in 2017. We were also told by the local Council late in 2014, that some of the current facilities, such as the kitchen/dining hall and the guest hut (both built as temporary shelters when Nhap Luu was first started), need to be replaced. Plans are being made for a dormitory for lay people and visiting monks, a public toilet facility, an upgrade for the meditation hall, and a kitchen/dining hall. We have about a maximum of two years in which to complete the process. By that time the current buildings will need to have been put out of service. We estimate the cost of the first building, a dormitory for 24 people, to be about $250,000-$300,000. The toilet facility will be about $40,000 and the kitchen/dining hall perhaps another $250,000-300,000. Put together, we may need to have about $600,000 to provide minimal approved facilities for activities at Nhap Luu. We need to practise a lot of mindful breathing and walking while looking at these issues. With spiritual Sangha building there is the need to connect local Sanghas into a more cohesive Australia-wide Sangha and to develop concrete training programs for practitioners aspiring to the Fourteen Mindfulness Trainings. We would also like to be able to offer teaching opportunities for suitable Order of Interbeing members. After the Spring Opening Retreat 2014, several members of the Order of Interbeing met with Sr. Thuan Tien and Br. Phap Kham to set up an interim OI Care Taking Council, which serves as a liaison between the monastic and lay Sangha and to work with the monastics on matters relating to lay Plum Village Australia's activities and tasks. These include fundraising, construction, retreat organisation, Sangha building, training and teaching. To help strengthen our Sanghas and begin to put some of these plans into action we will have a two day Order of Interbeing retreat at Nhap Luu on Sept. 24-25, right after the Spring Opening Retreat. All Order of Interbeing members are invited to attend to create a stronger network and support each other. In terms of training and opening up areas through which lay Sangha members can bring mindfulness practices into their professional lives as well, I hope to be able to carry out some activities such as those we have seen recently in Hong Kong. AIAB has established the Plum Village Mindfulness Academy, an Institute for Research, Education and Training in Mindfulness. Also established are the Mindfulness Teachers' Association, and Plum Village Mind-Body Well-Being Center. These are new Dharma doors that can inspire and involve lay members more in integrating mindfulness into the workplace. The PV Mindfulness Academy has commenced the first 1-year Mindfulness Teachers’ Training Program, lasting from August 2014 to July 2015, with a group of 26 participants. The implementation of these programs has been discussed with the monastic and lay Dharma Teachers in Australia. We hope to have more programs on offer as time goes by. but it has also already been completed. Members of the Birrarung Sanghain Melbourne have worked with the Sisters to help bring the current facilities up to an acceptable temporary standard for Council, and to design new replacement buildings and draw up some fundraising plans. Many thanks for their efforts. The intention is that once some preliminary work is complete, the whole project will be presented to the Australia Mahasangha for consideration. Go as a river, go as a Mahasangha. We need more than just one local sangha's full commitment in order to succeed with this. At the same time worrying about it too much is not useful. Things will happen when conditions are sufficient. Just keep on practising, and be in the present moment. From 2009 - 2011, Plum Village Hong Kong was in a rented apartment big enough for five monastics, in a crowded and quite noisy area. At times, we nearly ran out of rental money. But we kept on, keeping the trust that things would get better, and thus helped to create the conditions for things to happen. Then in May 2011, with the help of a local businessman who is also a practitioner, we moved to our current location up on the mountain with enough space for 20 monks and nuns to practise, and facilities sufficient to hold retreats. Without us having been there in Hong Kong, these things would not have happened. The monastics at Nhap Luu just need to be there. Their presence and their practice will help make things happen. The winter retreat has ended in all Plum Village centers. Many Plum Village monastics are already out on teaching trips, spreading the Dharma. What we want to accomplish is to build brotherhood and sisterhood, to be at ease and happy. As Thay has said, these things are already in us, they just need the right conditions to manifest. Look around and look within. The conditions for nourishing our beloved community are in our mindful breaths and mindful steps.